Since I began thinking of complexity and evaluation in this way I have been uncomfortable with the idea of just having a list of seemingly unconnected items. I have also been unhappy because presentations and lectures are not good vehicles for developing lines of reasoning. I wrote these posts to address these dissatisfactions. From my reading in complexity I have identified four themes that seem relevant for evaluation. Lately I have been speaking to as many audiences as I can about the need to focus on complex behavior rather than on complex systems. The reason is that there is no practical way to apply the notion of a “complex system” to practical decisions about program models, metrics, or methodology. But it is possible to make those decisions with respect to the things that complex systems do. I just completed a series of three short “coffee break” sessions on this topic for the American Evaluation Association. Go here for the slides. If you are a member of AEA you can also hear the audio presentation. Go here for the audio tapes. Recently a friend of mine asked about my understanding of what role complexity can play in Evaluation, and how I would further that role. Below is an edited version of what I sent her. Complexity as discussed in evaluation circles contains a great deal of information that is either wrong, or ill-chosen as elements of complexity that can be useful in Evaluation. Those discussions do not appreciate the broad and deep knowledge about complexity that has roots in many different scientific disciplines. Much (most really) of that knowledge is not applicable in the field of Evaluation, but some of it is. My goal is to influence the field to appreciate and use the knowledge that is applicable. As I see it, the critical issue revolves around program theory, i.e. people’s beliefs about what consequences a program will have, and why it will have those consequences. The problem is not methodology because for the most part our standard arsenal of quantitative and qualitative tools is more than adequate. The problem is that evaluators do not choose appropriate methodologies because their designs are customized to test incorrect program theories. Are Policy Makers, Program Designers and Managers Doing a Good Job if they Rely Too Much on Evaluation? We like to complain about evaluation use. People in my business (me included) like to lament the lack of attention that people pay to evaluation. If only we did a better job if identifying stakeholders. If only we could do a better job of engaging them. If only we understood their needs better. If only we had a different relationship with them. If only we presented our information in a different way. If only we chose the appropriate type of evaluation for the setting we were working in. If only we fit the multiple definitions of “evaluation use” to our setting. And so on and so forth. I’m in favor of asking these questions. I do it myself and I am convinced that asking them leads to more and better evaluation use. Lately I have been thinking differently. 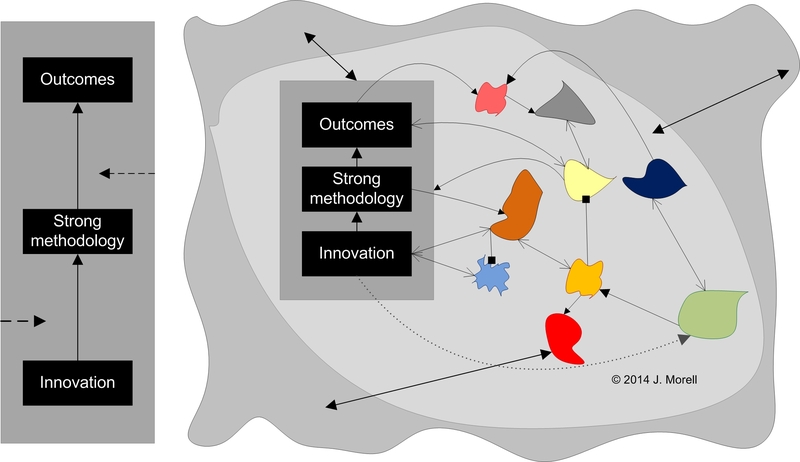 What is the Contribution of Complexity to Evaluation? This is the third of three blog posts I have been writing to help me understand how “complexity” can be used in evaluation. If it helps other people, great. If not, at least it helped me. In this section I talked about using complexity ideas as practical guides and inspiration for conducting an evaluation, and how those ideas hold up when looked at in terms of what is known from the study of complexity. It is by no means necessary that there be a perfect fit. It’s not even a good idea to try to make it a perfect fit. But the extent of the fit can’t be ignored, either. This is where the “turning the wrench” phrase comes from in the title of this blog post1. Considering what I said in the first two blog posts, how can I make good use of complexity in evaluation? In this regard my approach to complexity is no different than my approach to ANOVA or to doing a content analysis of interview data. I want to put my hands on a tool and make something happen. ANOVA, content analysis and complexity are different kinds of wrenches. The question is which one to use when, and how. Why do Policy and Program Planners Assume Away Complexity? How Can Evaluators Apply Complexity in a way that will Help Program Designers? This is the second of three blog posts I have been writing to help me understand how given the reality of how programs are designed, “complexity” can be used in evaluation . If it helps other people, great. If not, at least it helped me. I have been involved in evaluating distracted driving programs for transportation workers. While working on the evaluations I developed an interesting way to understand how programs are acting and what they are doing. The method is based on a few principles, one set focusing on the nature of timelines and schedules, and the other on data collection. Provide a reasonable plan whose tasks can be executed. Represent a reasonable correspondence between budget and work. Satisfy customers desires for when the work will be completed, and for how much.